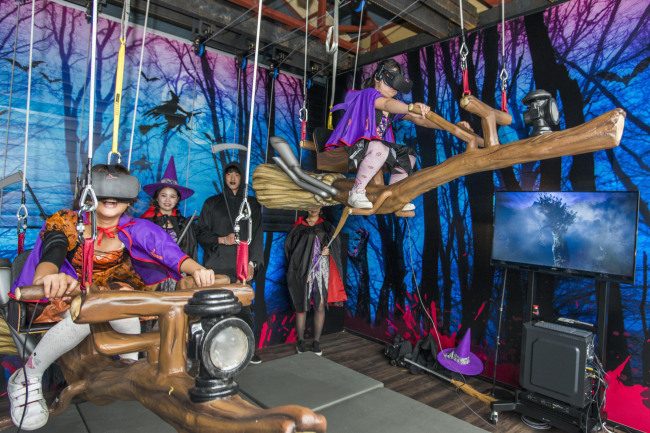 YONGIN, Gyeonggi Province -- If you still haven’t caught up with the virtual reality trend, Everland’s Halloween offerings could be a shock to the system. South Korea’s largest amusement park has been running since last month a horror zone filled with actors wearing zombie makeup and scary VR content to mark the Halloween season. As visitors in VR goggles walk around the park’s 100,000-square-meter Blood City, they are immersed in a world of horror with bleeding zombies and ghosts appearing out of nowhere. Taking the experience up a notch is a dark, wooden hut, where a VR-equipped visitors paw the air to complete a mission to find a cursed doll as part of a story on the virtual set. Through the goggles, the room looks more eerie as it shows rusty, bloodstained closets and furniture with spooky sound effects. Another VR attraction on the second floor provides visitors a chance to become a witch riding a flying broom. In partnership with Korean robot startup Sangwha, the amusement park is running Gyro VR and Robot VR, which visitors can experience being a fighter pilot and a robot respectively on moving seats, wearing Samsung Gear VR goggles.